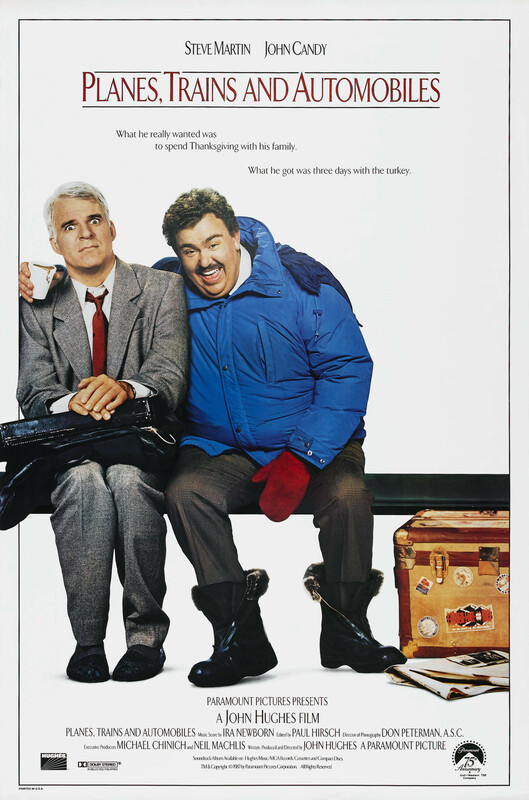 What It’s About: Executive Neal Page (Steve Martin) is trying to get home for Thanksgiving whose path keeps crossing shower curtain ring salesman Del Griffith (John Candy). Page can’t catch a break in his quest to return home, nor can he shake Griffith no matter how hard he tries. Much comedy results. Why Watch it Today? : Much of the film takes place today, the day before Thanksgiving. Those of you lucky enough to not be traveling this year, watch Planes, Trains & Automobiles to see writer/director/producer John Hughes last great movie, featuring the excellent pairing of Martin and Candy, and think of all of us suckers out there on the roads and airports. For all of our readers who, like me, spend the Tuesday or Wednesday (or worse, both) before the holiday traveling, may your trip be smoother than Neal and Del’s! This entry was posted in Buddy Flick, Comedy, Movie of the Day, Road Trip, Screwball, Slapstick and tagged airplane, Ben Stein, Chicago, Dylan Baker, Edie McClurg, Gary Riley, Hughes Entertainment, John Candy, John Hughes, Kevin Bacon, Matthew Lawrence, Michael McKean, Paramount Pictures, rental car, Steve Martin, Thanksgiving, train, triple threat. Does it look like we do? I’ve done two train based double features-Terror Train with Horror Express and the somewhat less unified The Train with Breakheart Pass, but I like yours-possibly if we make it an all day marathon with all the choices.